Hey, kidz! Let us rap at you for a second, homeskillets. It seems that being legendary pop culture icons with a history of film and television success that has endured for decades is worth less than someone who can make funny sounds with his mouth on the internet. Variety reports that the Muppets are being teamed up with an assortment of YouTube stars in an effort to appeal to you fickle young people of today, with your Zunes and Hot Pockets and Sega Dreamcasts and such. Jiggy-fresh! Disney’s Muppets Studio and YouTube Space LA have brought together various Muppet characters and paired them with YouTube personalities as part of a plan to introduce the Muppets to all you cool young folks who get your news from minute-long clips of people adding fart noises to Call Of Duty. Gnarly! 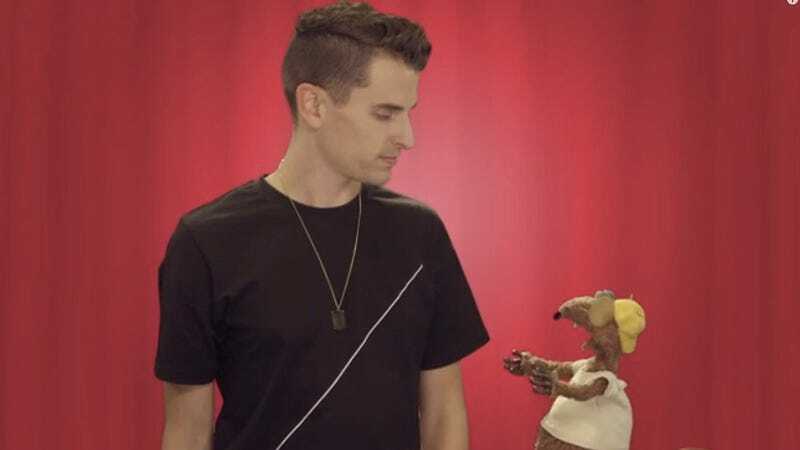 Your dope YouTube buddies who are participating in this project include a capella vocalist Mike Tompkins, musician Lindsey Stirling, something called a Vsauce3, speed-education group Crash Course, Barely Political, and Mental Floss. It’s cool like James Dean, only without the cigarettes because we all know smoking is hella bad for you and causes you to be mega-uncool, right? Truth dot org! The Muppet/YouTube star mashup videos will be rolling out over the next couple of months, and Disney is planning to subsequently release original content for the new Muppets YouTube channel through the rest of the year. And yo, Vanilla, check it: the first video has already dropped! It stars Gonzo, Rizzo, and newly minted Muppet character Constantine (a.k.a. evil Kermit) with the guys from Vsauce3 as they explore what would happen if Quicksilver ran past you. It’s like the sassy mashup video equivalent of a bomb-diggity Skrillex song! You kids still like Skrillex, right? He’s totally the Muppets of EDM! Word to your moms!